As we consider our infrastructure needs and how to pay for them, we should take a look at the results of our previous behavior and decide whether a course correction is in order or if we should keep doing more of the same. Let’s consider housing supply and demand in the region. When we build new infrastructure that opens new areas to housing development, the housing supply curve shifts to the right. When new households are created or move to the region, the demand curve shifts to the right. 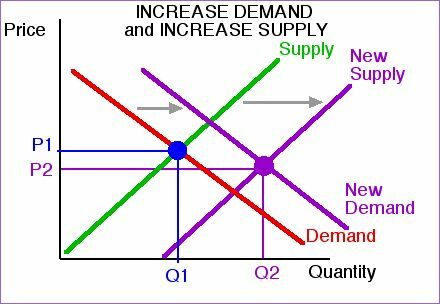 So if supply exceeds demand, housing prices go down (St. Louis); if demand keeps up with supply, prices are stable, and if demand out-paces supply, prices go up (San Fransisco). Let’s examine real numbers from Metro St. Louis. 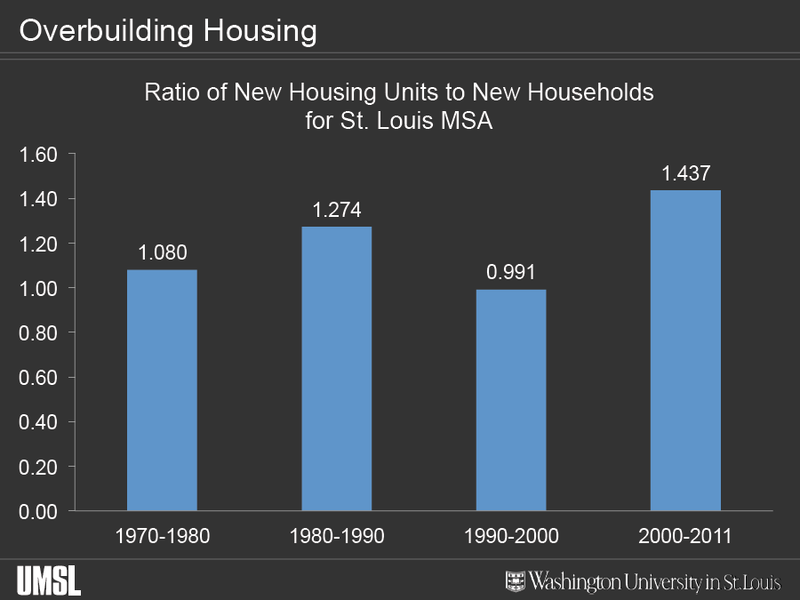 Over the last decades the supply of new housing units has far exceeded the demand by new households. Zooming in this can look great. Downtown has seen a lot of new housing units and has become a thriving neighborhood. O’Fallon’s population has quadrupled in the last 20 years. But large areas are declining. Let’s zoom out a little bit. A lot of wealth has been leaving St. Louis City, not a big surprise. What’s shocking is how much is leaving St. Louis County. A canary in the coal mine is the county’s three dead malls. A significant portion of this can be attributed to the conveyor belts of sprawl that we have built. No doubt a lot of what St. Louis County has lost is made up for by the gains in St. Charles and other counties, but we’ve saddled ourselves with much more infrastructure to maintain. The combined population of St. Louis City, St. Louis County, and St. Charles County has only grown 1.2% since 1970 (That’s not 1.2% per year) yet we are on the hook for much more infrastructure. This represents a future liability- to what end? What’s truly tragic is when an area goes from just being an affordable one to one where there are few job opportunities, education quality is declining, and property values fall so much that it is not worth basic maintenance, let alone rehabilitation or new construction. Social collapse and abandonment ensue and murder and mayhem follow. These areas go from producing wealth to being a liability for the region and state. 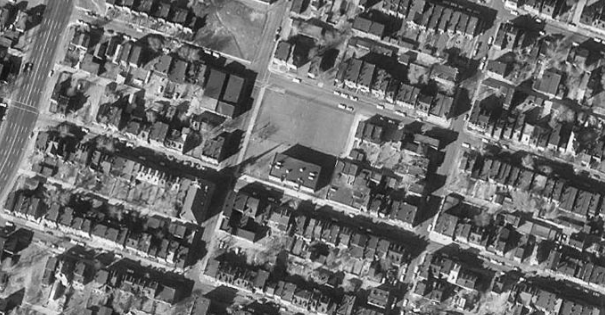 The above image is in the Northside Regeneration project area. The biggest threat to its success is continuing to build under-priced housing in the outskirts which only incorporates the little bit of infrastructure needed to access the new land, not what will be needed when things get busy out there (Hello Page Ave Extension, phase II, III, IV and beyond). That’s why it takes a $390M TIF for Northside. It is in competition with the development on the edges. McKee recognizes that he needs new jobs there to attract new people, moving the demand curve. If the region wants this area to stop being a liability, we need to slow the effects on the housing market by easy growth on the edges. We’re a slow growth population region. To the extent that government spending and regulations undermines our property values, it should be changed. Instead of using resources to hurt ourselves, we should use them to enhance existing productive places and shift the demand curve by nurturing economic activity that makes us wealthier. *Originally published April 7, 2014 on nextSTL.